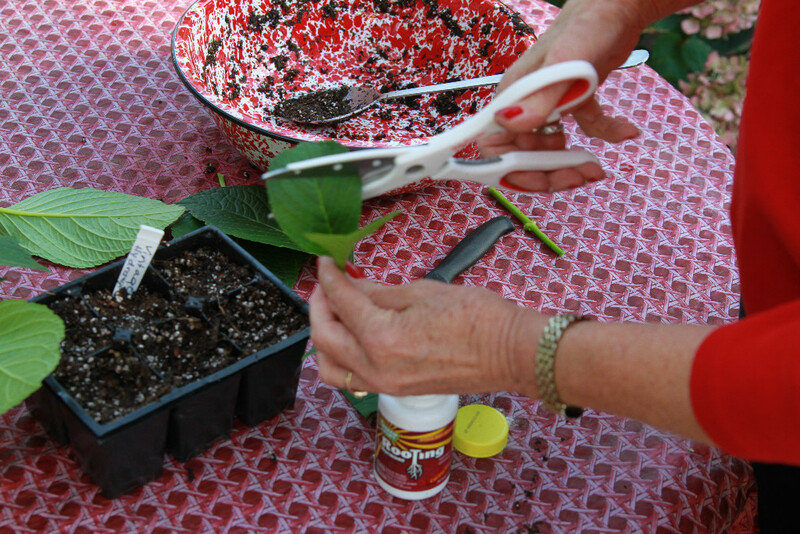 Hydrangea Cuttings…Make More of the ones you love! 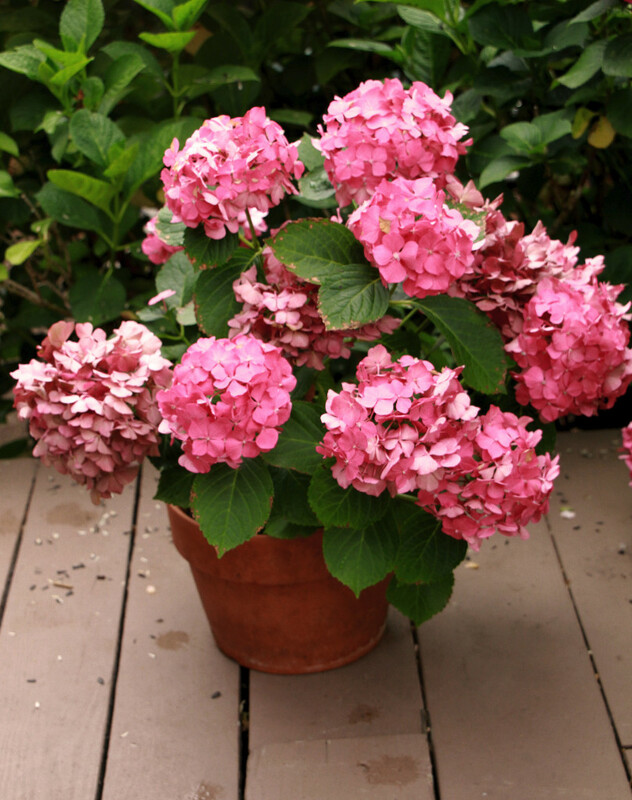 July is the perfect month to take cuttings of your favorite hydrangeas so you can have more to grow and give away! 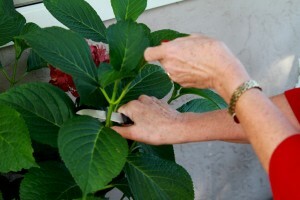 The stems should “snap” when you bend them. Not bend like rubber….too soft and young….not be hard and woody….too old….but a nice “snap” is just right! Pick a stem that hasn’t flowered this year if you can, with 2 or 3 sets of leaves somewhat close together. If the plant isn’t getting enough light the spaces between leaves may be 5 or 6 inches and that makes it hard to do cuttings. 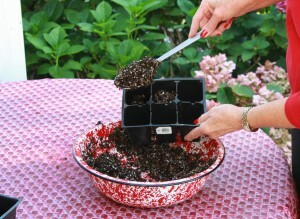 Step Two: wet some packaged potting mix (not garden dirt….it isn’t sterile and cuttings can mold or rot). You don’t want it soggy but just moist all the way through. Step Three: put the mix into six packs ( they don’t last long in these and you’ll have to re-pot sooner…..or into 4 inch pots which will keep them happy a while longer. Step four: Make a clean cut with a sharp paring knife and dip the cut end into rooting hormone to encourage quick rooting. If it doesn’t stick you can moisten the cut end with a little water. If the leaves are big you may want to cut them in half. 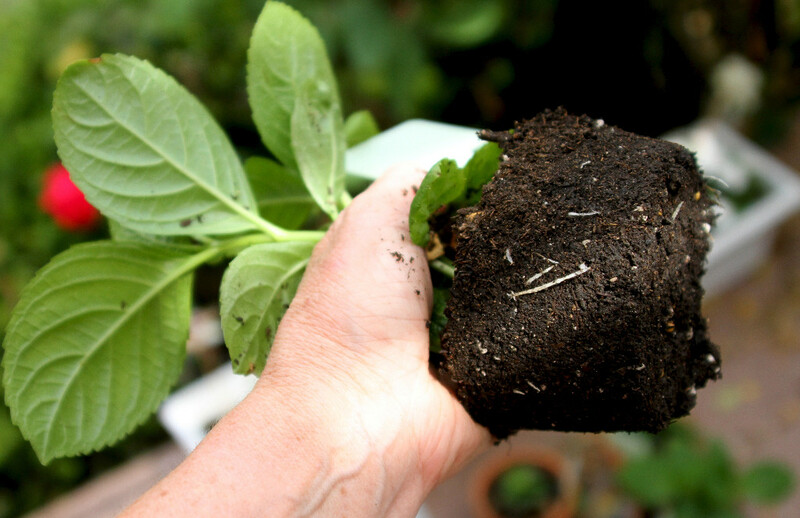 Step Five: Make a hole in the mix with a pencil so you aren’t pushing the stem into the mix and wiping off all the rooting hormone. Push mix firmly around the cutting and water lightly. Step Six: Because the big leaves let off water quickly and without roots have no way to replace it, you need to create a mini greenhouse for them until they root. Keep them in the shade and certainly out of hot sun. 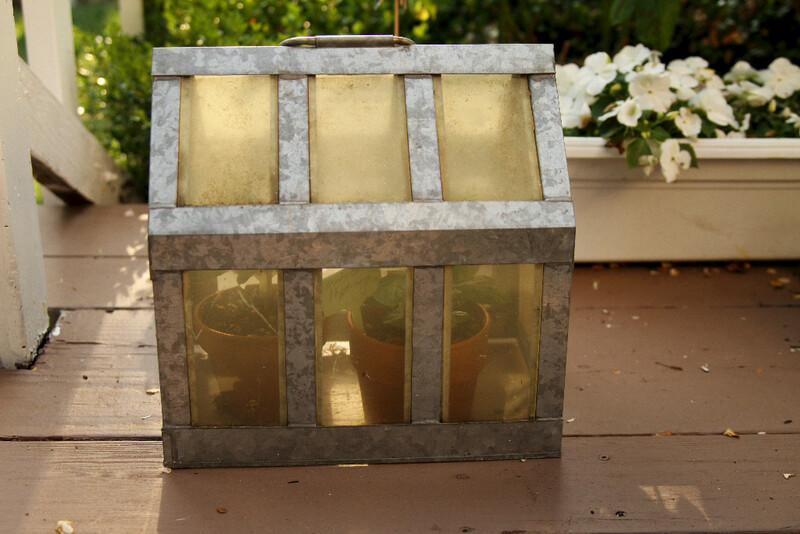 Lift the “greenhouse” if it gets too hot. You can use a liter coke bottle with the bottom cut off to fit into a four inch pot. 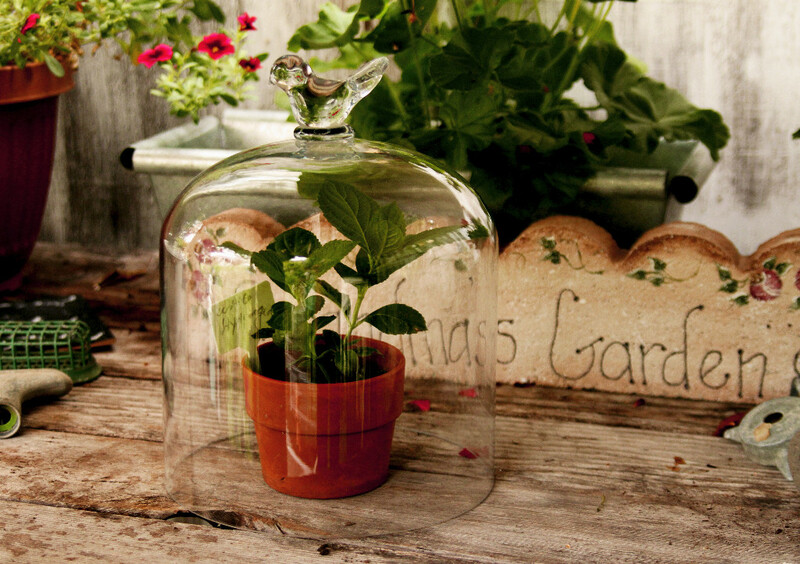 Or, like I did you can go to a Marshall’s, Ross or TJ Max and look in the house ware section for for glass cake domes (see first photo). They work great if you pick one that’s tall enough and only cost about $10.00. 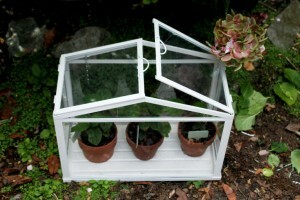 IKEA has a nice looking mini greenhouse for $20.00 that works well too! Once the roots are filling the pot you can transplant..It can take two seasons to get a nice blooming plant but it’s worth the wait! 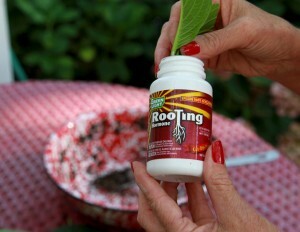 Both of these plants were started from plants growing in my garden exactly as explained above! 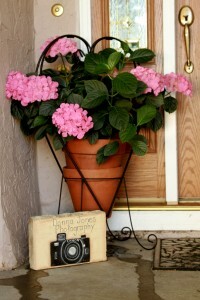 A plant this size at the nursery would be around $12.00 at least! Hot News! Just bought a new book I want to share! 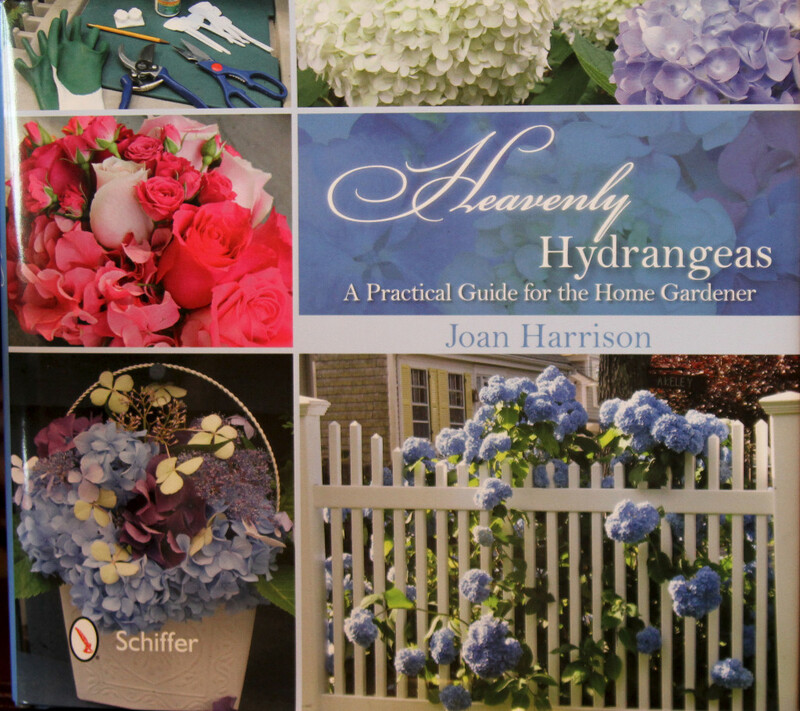 Heavenly Hydrangeas by Joan Harrison just published this year is GREAT! Full of detailed information on everything from selecting to growing to using the dried flowers! She writes from Cape Cod area but adds information for all Climate zones so it works even here in California. Really a super book for growing hydrangeas in a home garden! Get it on Amazon or your local bookseller! Please pin to share, and “Like” our face book page! You can sign up to be notified by email when new articles are posted as well! Happy Gardening! 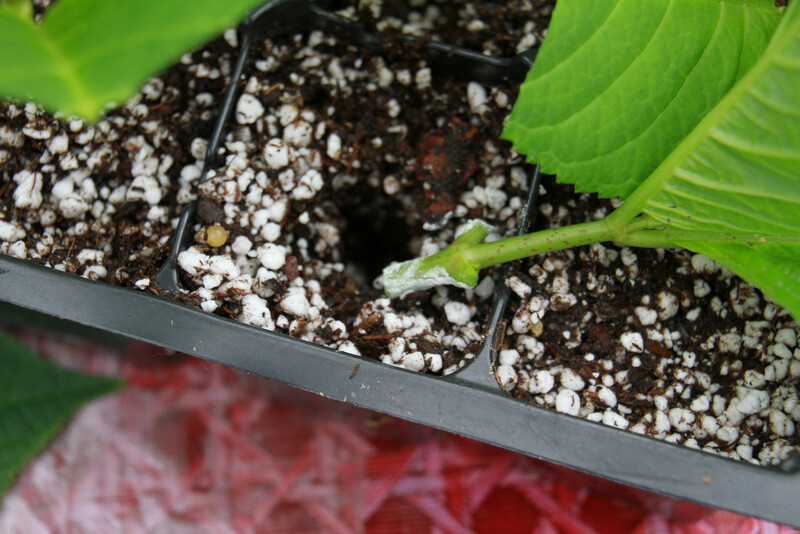 ← Beans…time to replant and other garden chores!